These time lapse videos were captured using the Shutter Ninja v2.0 and my Canon 30D. Quicktime Pro and iMovie were used for editing. Hawaiian Sunset from Shutter Ninja on Vimeo. This is a short time lapse from my vacation in Maui. The clip was shot at 8 second intervals with my Canon 30D and the Shutter Ninja v2.0. 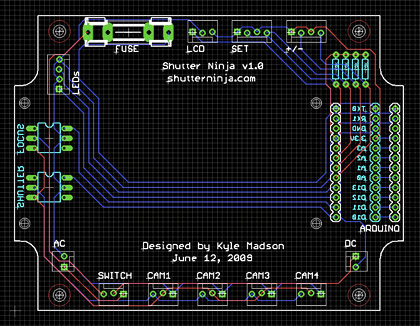 Shutter Ninja v2.0 PCB design is complete and has been sent to BatchPCB for fabrication! The device will be completed in April. I’m very excited to produce new time lapse movies! Check back next month for updates as I complete v2.0. These time lapse videos were captured using the Shutter Ninja v1.0 and my Canon 30D. Quicktime Pro and iMovie were used for editing. Milky Way Galaxy from Shutter Ninja on Vimeo. This is a time lapse of the night sky shot from the Galena Chain Lakes near Mt. Baker. Each frame is a one minute exposure shot at 30 second intervals with my Canon 30D and the Shutter Ninja v1.0. Night Sky from Shutter Ninja on Vimeo. This is a short time lapse (due to rain) of the night sky shot from Bumping Lake located east of Mt. Rainier National Park. I used my Canon 30D and a camera controller I designed this year called the Shutter Ninja. 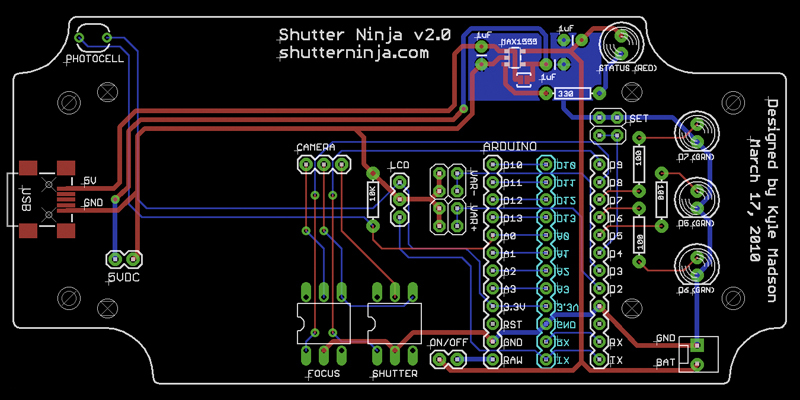 Check back for more updates as I document the design of Shutter Ninja v2.0. My latest invention is a camera controller used for taking time lapse, long exposure, and manual shutter photography. 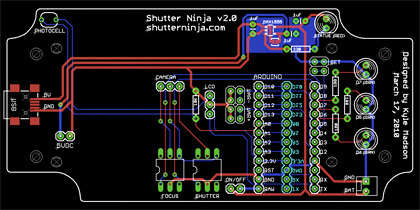 The Ninja utilizes the Arduino microcontroller platform as well as components from SparkFun Electronics. 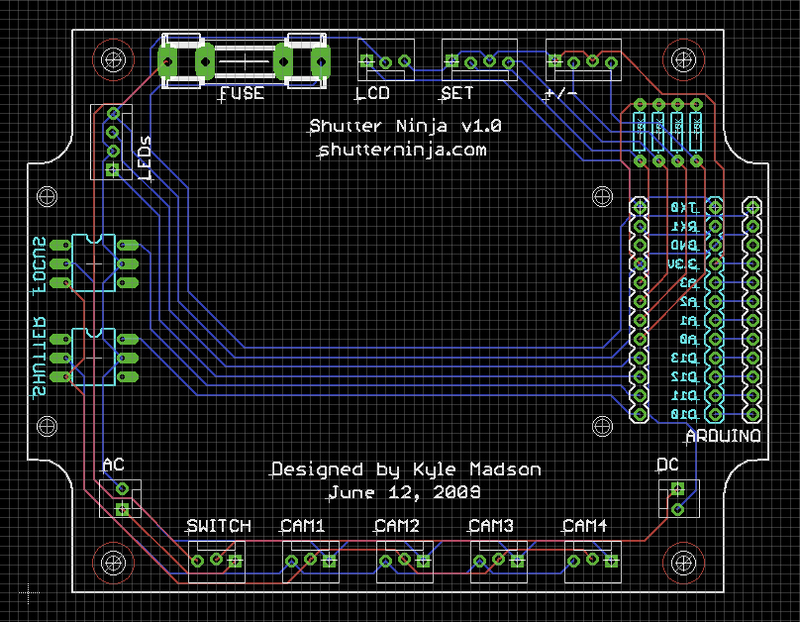 I developed the source code and main circuit board this Summer. 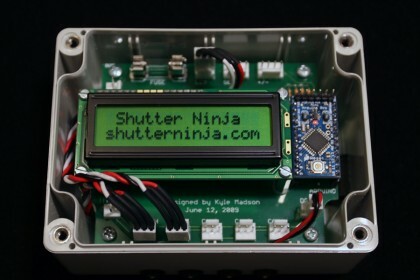 Future versions of the Shutter Ninja will be available as part of a kit or pre-assembled. More information will be available soon.